One of the highlights of any trip to this part of Costa rica is a surf adventure at Montezuma’s Playa Grande, which is a thirty minute walk north of town. This white sand beach has small, consistent waves without rocks or people to bump into, so it’s great for beginners. Intermediate surfers like it too, depending on the waves size, but more advanced surfers go elsewhere… usually to Santa Teresa’s breaks. 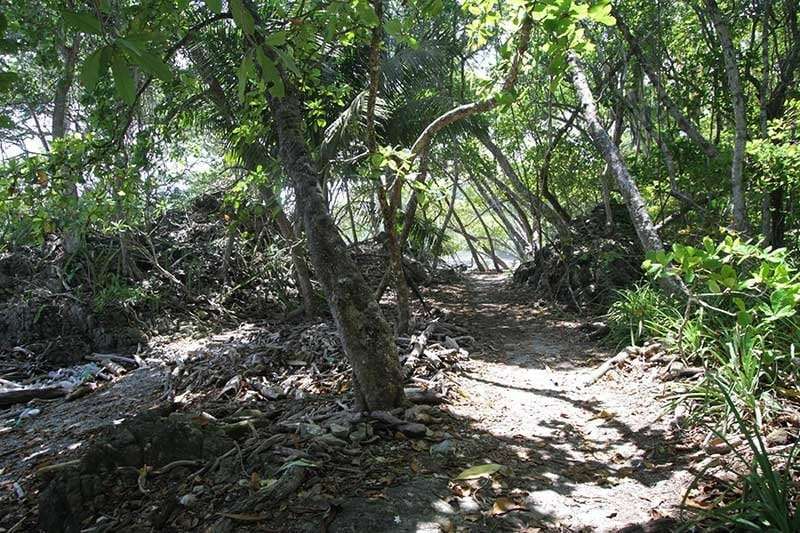 The path follows the beach and goes up into the jungle a few times, and there’s usually a chance to see monkeys or other animals along the way. Sometimes on the beach we see baby turtles hatching. There are also two turtle protection hatcheries along the path that you can check out. Spoiler Alert! The following set of photos will give you an inkling about what this adventure is like… if you prefer to be surprised then stop reading now! Beach Path – a beautiful path follows the beach and crosses over a few small hills. Don’t worry, you don’t have to carry a surfboard because we have them out there at the beach waiting for you, and a few snacks too. 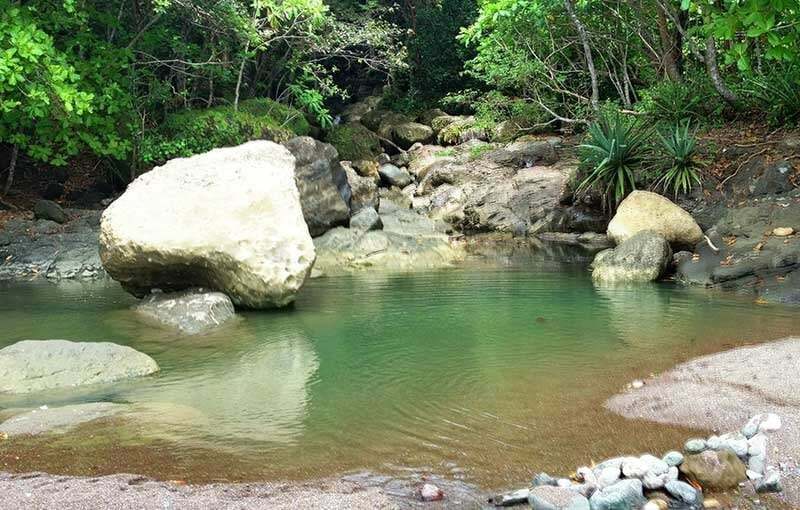 Piedra Colorada – Halfway to Playa Grande, we find Piedra Colorada “Colored Rock” which has a freshwater pool and a small waterfall. Here you can take a dip to cool off, or on the way back you can get the salt and sand off. This is a favorite beach for all of us “locals” to hike out to with our kids, because it’s only 15 minutes from town, avoiding most of the tourists. There’s no development and it’s within a small sandy cove. National Wildlife Reserves – The beach trail winds through groves of coconut trees, as it passes through three national parks/reserves. There is little no development along the beach for for most of the journey. 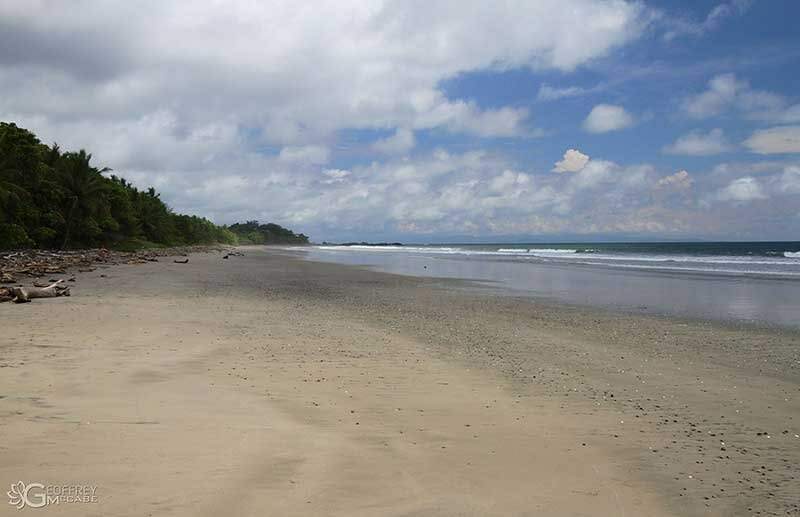 Playa Grande of Montezuma – This is how the beach looks when you first arrive. It’s a broad, flat white sand beach with small waves, perfect for beginning surfers. The jungle-covered hills are part of Romelia National Wildlife Reserve, which is managed by a local family who has lived in Montezuma for more than 40 years. They have a volunteer program that helps keep the beach clean and staffs the turtle egg sanctuary. Until a few years ago when they started this program, poachers robbed all the sea turtle nests, but that has now been stopped. Surf School – Surfing lessons begin with an explanation of how to paddle and practice jumping up on the board. Beginners will use large boards that are soft, very buoyant, and catch waves easily. Here, Manuel, one of the owners of Young Vision surf school, is demonstrating the surfing stance. 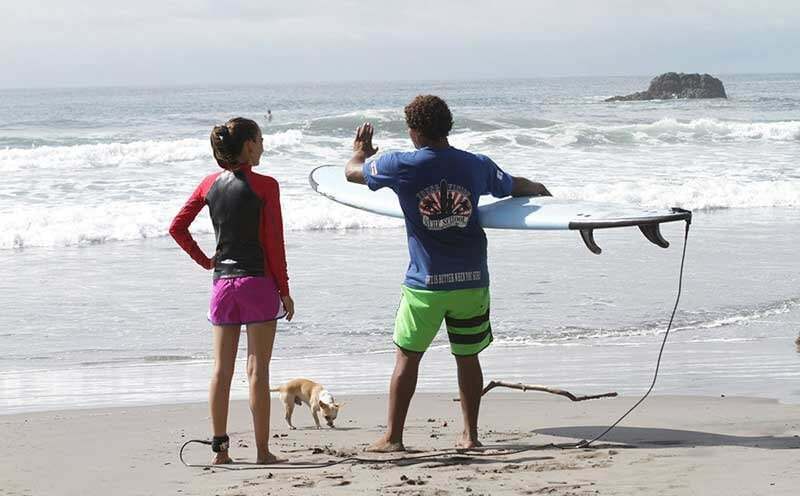 Our Surf Instructors – Anamaya works with local Costa Rican instructors, most of who grew up in Montezuma and have been surfing here since they were children. In addition to being licensed surf instructors, instructors such as Manuel are certified life guards, and also are certified nature guides, so you’ll learn a lot about the local plants and animals along the way to the beach. 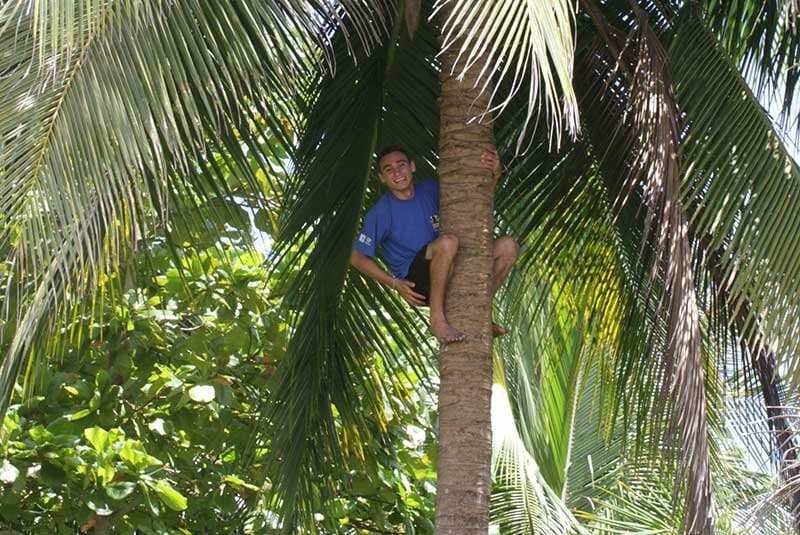 Fresh Coconuts – One of the instructors will usually delight the guests by climbing a coconut tree to get a few down to share with the group. There’s nothing better in the world when you’re hot than fresh coconut water. 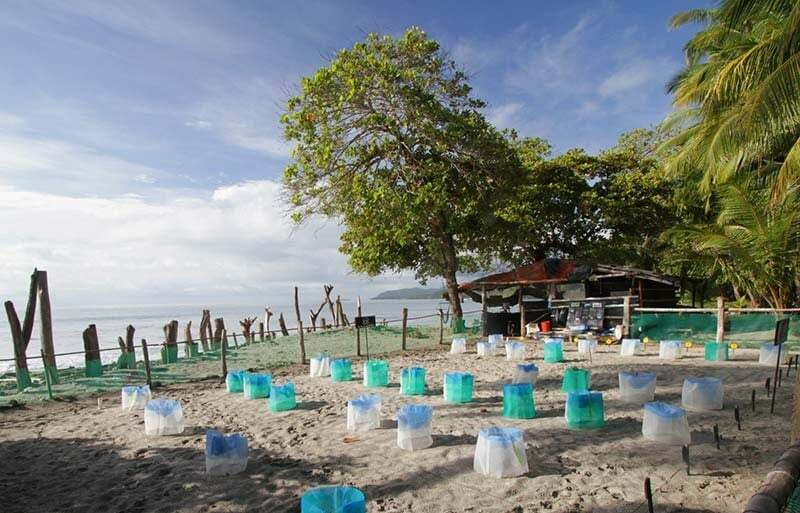 Turtle Sanctuary – A few rugged volunteers from around the globe live in some huts tucked back from the beach, staying up all night to guard the turtles from poachers. When they find a mama coming to lay her eggs, they will protect her and then move her eggs to within their sanctuary when she’s done. When the babies hatch, they will also help protect their march to the sea. 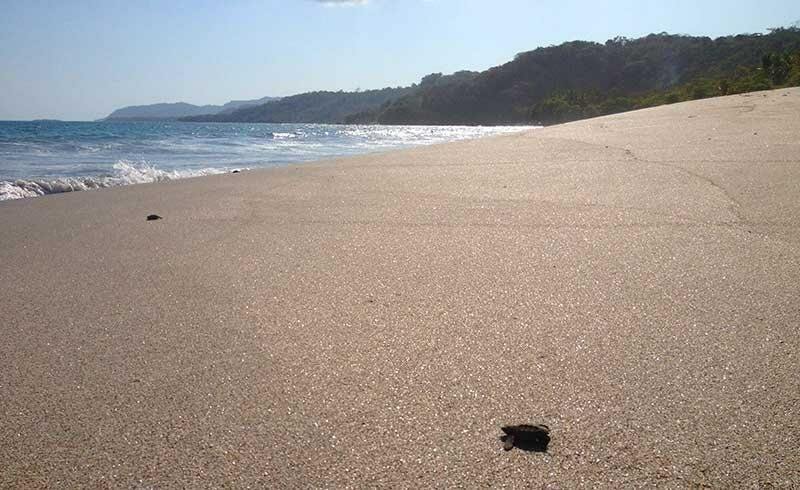 Baby Sea Turtles – On a lucky day you may witness the hatching of baby sea turtles. In this case, we found a nest hatching that was missed by the volunteer, and everyone gathered to keep birds and animals from eating them. Once they’re in the ocean, they’re on their own, but a little helping hand from humans is helping to get their numbers back up after decades of destructive egg stealing. Surf Camp – Finally this surfing student gets up on the board for her first successful ride! Our instructors help a lot in the beginning, literally hurling the students on their boards to catch the waves, and screaming lots of encouragement. For many, taking a surf lesson in Costa Rica is a dream come true, and there’s no more spectacular place to do it than at Playa Grande.